Launch.it is essentially a self-publishing platform. Anyone can publish news on the site. Trace explains how he envisions Launch.it changing PR. Trace also discusses entrepreneurship in general and how he got started with Brand Yourself under his father’s mentorship. Announcer: What’s great about the shows you’ll find on JasonHartman.com is if you want to learn about investing in and managing income properties for college students, there’s a show for that. If you want to learn how to get noticed online and in social media, there’s a show for that. If you want to know how to save on life’s largest expense, there’s a show for that. And if you’d like to know about America’s crime of the century, there’s even a show for that. 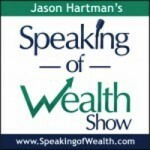 Yep, there’s a show for just about anything; only from JasonHartman.com or type in Jason Hartman in the iTunes store. Jason Hartman: It’s my pleasure to welcome Trace Cohen to the show. He’s the founder of Launch It and this is a very interesting platform that may be useful for events and trade shows that you are doing or involved in and we’re going to learn more about it. Trace welcome, how are you? Trace Cohen: I’m doing great. It showed a little yesterday in New York but today’s a little nicer. Jason Hartman: Yep, you’re coming to us today from New York City, the Big Apple. Good stuff. Well, tell us a little about Launch It and what the genesis of it was. Trace Cohen: Yeah, so we started Launch it a year and a half ago and it started as a PR platform for anybody to launch any news that they had. We really wanted to create the biggest searchable database of everything new. I had my first company in digital media, reputation management, my father built and sold one of the largest PR agencies and I kind of took his physical kind of prowess and business savvy with my digital intelligence being millennial and built this platform to make sure news had a home online. And as you mentioned, we kind of got into the conference space as we’ve attended so many trade shows and expos on behalf of our PR clients when we had an agency, and we found that it was just a lot of noise but no way to find out all this news. And kind of the mentality of why people rob banks; that’s where the money is. People go to events because that’s where the news is. So to create that large database of news, we started building digital publications for conferences and it just kind of took off from there. Jason Hartman: So when you say digital publications, what more specifically do you mean? Trace Cohen: So, anything that’s not physical. So if you do PR or if you go to a show you generally get a paper press release, press kit, which might have a company overview and bio or even a flash drive which I’m sure everybody at this show has been handed. And so you can’t socialize at news, you can’t search it, you don’t get any SEO value out of it, which is my background and so we wanted to basically turn these shows into their own publications. Because they have hundreds, if not thousands of exhibitors and that makes so much news that they’re not harnessing. So it’s really just getting your news from a physical standpoint and complementing it with a digital one. Jason Hartman: So, I mean, we all in our businesses use digital platforms. We use all the social media platforms probably, our own websites; what specifically is happening here? Like, take us through the process if you would. Trace Cohen: Yep. So generally in PR when a company makes an announcement, they blast out the news to someone who is hopefully paying attention at that exact time. So that’s the media who is doing their own thing, they get the Email, maybe they’re interested, maybe they’re not. You send it out to your customers and community; they’re busy working, and they might or might not read the news. The anomaly of events though, is when you send out news during event time, everyone’s waiting for that news, they’re really hungry to find out what these companies are doing and what is going on. So instead of just kind of shouting in an open room, you have now a built in audience waiting to find out your news. And that was kind of the interesting part of our new business, our pivot to events that I really liked and enjoyed. People are hungry and looking for news and our goal is to give them one single location with all of it. Jason Hartman: Yeah, fantastic. Tell us about someone doing an event…first of all maybe, what size clients are using this platform? Can it be a small trade show? I mean obviously I’m sure it can be a big one. Give us some examples of what happens out there. Trace Cohen: Yeah so we actually have the two biggest clients in the country. They were our first two clients amazingly. We work with CES. They have 3,200 exhibitors, 200,000 people attending their show, 5,500 registered media. We only work with a portion of the show, about five or six hundred of the exhibitors. But that for them is pure for media, becoming more social and kind of really engaging kind of long tail as we work with the startups in Eureka Park for CES. On the other side is a conference by the association of equipment manufacturers called ConExpo-Con/Agg. It’s the largest show in the country by square footage with 2,400 exhibitors. And our goal is to create for them a digital publication for their entire industry. They have about ten to fifteen true media publications where tech has unfathomable amounts, hundred thousand. So for them our goal is to turn them into the digital publication for the entire industry. We also work with other shows that have 200, 300, to 500 exhibitors. And so each industry, construction tech, health and wellness, and one of our shows is a sweets and snacks expo; The largest candy show in the country with about 500 exhibitors, is just to get the news online and then from there you can syndicate it, you can socialize it. It makes it a lot easier for the news to be found before, during and after the show. So that once the physical event is over, it still kind of lives on until the next one begins. Jason Hartman: But it’s always built around an event, right? Or do people come to this for general PR? Trace Cohen: So our focus now is on events for that moment in time, but to build buzz up before when you have the show to make sure people are aware of what’s going on and then after is a follow up to kind of keep up to date. Launch itself, Launch IT, is a free publishing platform for anybody to publish the news at any time. Announcing or letting people know about whatever they do. And that’s the free side of it and we support that with our events. Jason Hartman: Do you envision it changing the PR industry? Trace Cohen: that’s definitely our goal. We want to make it more efficient. Get rid of all that friction between the consumer, the media that covers our news, and the actual company itself. The media is great, but the news that they cover is maybe one percent of all the news out there. For every new app that you read about, there’s a hundred apps that either do that or they couldn’t cover. And so our goal is to unlock that news whereas I read the news in tech and sometimes I’m just not impressed. Maybe it’s a slow day. But there’s so much other news I would be interested in but it’s just not online any place for me to find it. Jason Hartman: Yeah I mean, everybody puts it on their own site, though. And they do their own marketing in their own social media sphere. What’s the big benefit? Is it traffic you’re offering to them? Trace Cohen: So for Launch.It itself, the free side, we don’t need exclusives. It’s just another place to publish your news and we’ll share and socialize it to our community. We have great SEO, probably better than most companies’ websites, so we’ll hopefully come up in search engines higher than them, so just helping them increase their visibility, so traffic. For events though, we send all the media, we send all the attendees to the digital publication that we grow for the actual show itself, so they have their physical booth there. Hopefully people walk by, I’m sure they Email a lot of people but besides that they have no physical, no digital precedence. And that’s what we really try and help them with. It’s something they can’t really do by themselves. And the show can’t support individual exhibitors unless they’re sponsors so we kind of level the playing field and make sure all the news is viewable by whoever’s looking for it. Jason Hartman: Fantastic, so tell us a bit, give us more of your thoughts about the PR industry. You have a big background there and you mentioned the friction in that industry between people having access first of all, to a PR firm or doing it themselves and then getting reporters to pay attention. And there’s a lot of intermediation there, isn’t there? Trace Cohen: Yeah there is and there really hasn’t been much change to the actual PR industry itself. When my father had his agency, I’d hate to do this before kind of the internet and there were phones, well there were, but no Email. They had to stuff press kits, send it to the media and wait to hear back. There’s no analytics, there’s no saying did they receive it, did they open it, did they click on it so that’s one aspect that’s really changed. Being able to see exactly what actions people have taken. With technology things are definitely moving quicker so I always hear from older PR professionals that they used to be able to sit down at the media and have that monthly time where you can sit down, run through the product or service and if they had any questions, you could kind of work with them and get a real in depth story. Now you can send a press release, they’ll copy and paste it and they’ll just credit to them or they can just write a story and it goes up within a few minutes or a few hours so the lead time between media and companies getting their news out has definitely decreased. And now companies can just announce anything themselves. They can use Launch.It, they can use their blog, they can build up a Twitter following, Facebook groups, Pinterest boards, and so really just utilizing more and more communities and not just solely relying on the media which is just one strategy that we had in PR. Jason Hartman: What do you think about wire services like PR news wire and business wire, I think they may have merged, but forgive me if they have, but is that an old fashioned thing? Do we need a wire service anymore? Trace Cohen: So they’re definitely old fashioned. I think they’re still somewhat relevant. My father’s company was the largest user PR newswire in the late 90s. When he handled huge clients, you needed to push that news out. I don’t know actually where that news goes when you put it out over the wire, but we encourage our clients to use any tools they have at their disposal, whether it’s Launch.It, their blog, the wires, there is some SEO value or at least there was. I think the humming bird update to Google might cause some issues for that. It’s definitely an older technology. And we’ve met with them before. So we’re always looking for ways to partner with them as they have a PR industry, they are stalwarts to most PR professionals, so they’re definitely relevant and whatever it takes to get the news out we encourage all of our clients to use them. Jason Hartman: So what else should people know about having successful events or getting more PR and media attention? Trace Cohen: A successful event we’re finding in every industry is a bit different. But it’s really just the mood of all the people there, making sure they have a seamless experience. So they all have apps. Generally people are happy with the apps that have information about the sessions, the schedule, where people are speaking, and now they’re getting into somewhat of social networking. Jason Hartman: And just before you move on, what you’re mentioning is event specific apps that may have maps. Maps of the trade show, maps of the break out session rooms, an agenda with the schedule and so forth. And some communication can take place over those apps too, but go ahead onto your next thing. You were talking about socializing. Trace Cohen: Right, so those apps are great. And we don’t have a mobile app, as we want to partner with all these companies and that’s what we do with all of our trade show partners. Whatever app they’re using, they love our service because we generate more content that was all physical and we put it into the apps. So we basically just give them more content fodder to make their app a little bit more robust. On the other side, it’s about the user experience, and so usually you go around and you go to every exhibit. You kind of look at them, you read their material, and I call it speed dating almost. You go around and you’re like eh, they’re interesting, but that’s not really what I want. But you go up and say hi how are you, what do you do, this is what I do, and it’s kind of like speed dating. And so with Launch.It, we want to turn that into online dating where you can view their profiles beforehand. You can get their information, their background, who they are, do we have friends in common, can I ask for referrals. If you have a successful event, the first one is always the easiest to do but the second one will really tell whether or not it will really stick in the industry. And so it’s a mixture of technology to make sure everybody knows what’s going on, making sure you have great exhibitors, that people come and find news that they’re interested in. and then that they learn something new. A lot of people go to find what’s new at the show which is why that’s our focus of news. And then last of all they want to party. These events are usually once a year, so they get out of the office. It’s a great time to mingle, get a lot of business done. Face to face is still very prominent and very effective. Jason Hartman: Fantastic. Any thoughts, Trace, on the models that work, and this is probably just industry specific so you can’t answer it, but I’ll just throw it out there…the best models that work in terms of ticket prices; high price, low price, middle, free, what’s the best thing to do if someone wants to do their first expo? How do you pick those price points and things? I find that to be very challenging. Trace Cohen: Yeah it’s definitely industry specific but it’d be under overhead if you have a huge spectrum. So there are all those kind of Eventbrite meet ups which are more of just a gathering of people over like mindedness, same industry or some type of passion that they share. And so those you usually see tickets going for ten or twenty bucks. Kind of like a bozo fee to make sure that if you register you’re actually coming. And then the CES’s of the world where it’s actually free to attend if you have been there once before and you’re in the industry. Other shows, like the TechCrunch Disrupts, at least in the tech industry are upwards of a 1,000, 2,000 dollars because of their great content, the speakers they have, and the possibility of meeting great companies and collaborating and so it’s what you think people are willing to pay. And it’s definitely a balancing act. And so you definitely give discounts and early birds. There’s a lot of promotions where you pay $500 now but if you do it before a certain date you get $200 off. Because they want to sign up as many people as soon as possible. On the exhibitor’s side though, for a lot of the shows that we work with, when their 2013 show is done they’ve actually almost sold out their entire floor for 2014, which gives them almost a year of ramp up and less sales to do exhibitors and then they can tell all their sponsors, we have all these exhibitors already coming, we already have the show floor, we can always expand from here. Kind of if you build it they will come. If you have all those exhibitors and sponsors, generally people will go and be excited and enjoy it. Jason Hartman: So I was going to ask you about the exhibitor side of it too. So it’s basically attendees, exhibitors and sponsors. Those are the three revenue streams, typically right? Trace Cohen: Yes. And we’re trying to monetize the news as well, so we’re trying to create a new revenue stream but generally those are the three depending on how you do it. Sometimes it’s completely open to the public, so it’s free and they just want as many people as possible. Other shows we work with are only industry specific professionals, so they’re not open to the public and they’re generally smaller. So it’s really just more efficient in terms of who you meet and the potential for doing business. Jason Hartman: Good stuff. Hey, do you mind if just before you go if I ask you a couple questions about your father and his background? Jason Hartman: So first of all, what was his PR firm name? Trace Cohen: Yeah, it was called TSI Communications. Jason Hartman: And was it industry specific? Trace Cohen: Yeah, he was the first tech PR firm. Started in the last 70s and early 80s. Jason Hartman: That is early. 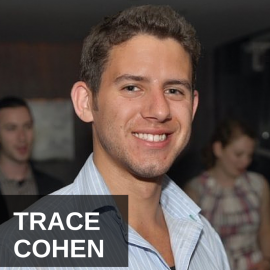 Trace Cohen: Yes and so it grew to about 300 PR professionals. And handled I believe all of Sony and IBM and sold it in ’98 or ’99 to the IPG Weber Shandwick Interpublic Group. Jason Hartman: Sure, sure. And he was the very first investor into Pinterest, right? Trace Cohen: Yes before they were even named Pinterest. Jason Hartman: Wow what were they called then? Trace Cohen: Uh, Tote. They won the NYU business plan competition so they were born and bred in New York. Jason Hartman: Great, great. So did he just know they were going to be a winner or did he and they get lucky? How did that work out? Trace Cohen: Yeah he said that once he met Ben the CEO, within 15 seconds he knew there was something special there. Maybe it wasn’t Tote or Pinterest initially, but what you have to really bet on is the [0:18:40.8] and so he thought Ben was special and he put a bet on him. Jason Hartman: Yeah, yeah. Good, good. The reason I ask that question is because I always like the saying, it’s better to be lucky than good. It’s good if you can be good but it’s great if you can be lucky. Trace Cohen: There’s definitely a little bit of luck involved, there’s due diligence, there are angel investors who kind of just give money to ideas like you talk about over dinner and then there are professional angel investors who actually do the mentoring, work with the founders, enjoy them, so I know that he spent a lot of nights with them and helping them out. Jason Hartman: And he actually runs a very large angel investor group in New York, right? Trace Cohen: Yes, the New York Angels. Jason Hartman: Yeah, fantastic. Not to be confused with the Anaheim Angels which is a baseball team. Trace Cohen: Yes, not those angels in the outfield. Jason Hartman: Totally different kind of angel. And then you were an original founder of another successful company called Brand Yourself, right? Trace Cohen: Yup. Founded that in our dorm rooms at Syracuse. Jason Hartman: Oh fantastic, yeah. Do you want to tell us about that at all? Trace Cohen: Yeah, so I started that with my roommate in college so the typical start up story. When my roommate was looking for a job, he couldn’t get one, finally we googled him and inmates.com came up. Everyone thought he was a parolee. When you googled my name, there was a blogger, and they thought that was me when obviously it wasn’t. so we started building websites for our friends helping them with SEOs so when you googled them, actually their results come up. Whether it’s their Twitter, their blog, showing that they’re somewhat proactive in the industry. And we grew that for about two years. And when I graduated from Syracuse I resigned from the company to start working with my father on Launch.It. Jason Hartman: Fantastic. So how old is Launch.It? Trace Cohen: We launched May 9, 2012. Jason Hartman: So just about a year and half then? Jason Hartman: Yeah and are you satisfied with how it’s been so far? Trace Cohen: Yeah, I’m very happy just knowing how many years it can take just to get traction, and the roller-coaster that we’ve gone through, why are we doing this, and oh my god we got the biggest client, the biggest shows in the country using this, we’re probably onto something here. It’s definitely gratifying, but in New York City, everybody has a startup. We say it’s almost the only way you can get a date on Friday night. Unfortunately 99% of us will fail, so it’s tough but I’ve never had a real job, I’ve always worked for myself and it’s been fun and especially working with my father. No one knows how I can work with my father just because I can’t imagine working with a parent otherwise, but it’s been great. He’s a mentor to me; we get along really well. And we have no toes to step on, we have no ego, so he says something, we go back and forth, we can make a decision pretty quickly. Jason Hartman: Good. Good stuff. Nice to hear. Well, Trace Cohen founder of Launch.It, thank you so much for joining us today and I should just clarify the domain name, it’s launch.it which is actually an Italian high level domain name but it comes across for marketing very well. Launch.it. Trace Cohen: I want it to be a verb. Jason Hartman: You want it to be a verb. That’s a good goal, excellent. Well Trace, thanks so much for joining us today. Trace Cohen: Yeah, my pleasure. This was a lot of fun.